Bulgarian journalist; born at Shumla, Bulgaria, in 1864. He published in French "Petite Histoire des Israélites," Philippopolis, 1897, a text-book containing a résumé, chapter for chapter, of Theodore Reinach's "Histoire des Israélites." 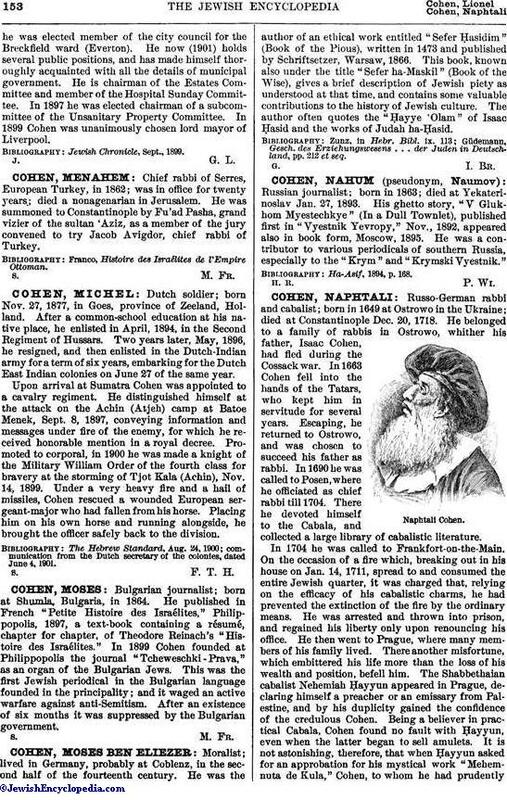 In 1899 Cohen founded at Philippopolis the journal "Tcheweschki-Prava," as an organ of the Bulgarian Jews. This was the first Jewish periodical in the Bulgarian language founded in the principality; and it waged an active warfare against anti-Semitism. After an existence of six months it was suppressed by the Bulgarian government.